Typically, when a person thinks of their refrigerator, they are not wondering about who invented the refrigerator (which, by the way, was designed by Oliver Evans in 1804 and a working prototype built by Jacob Perkins in 1834). Rather, the typical person is thinking along the lines of whether to get a compact refrigerator, or full size. Or perhaps they are wondering if they should go with a stainless steel refrigerator, or some other style. Not to mention all the questions that can be generated by the freezers that most refrigerators come with. The greatest concern that many people have though is not any of the previous questions, but rather how to keep these vital appliances clean. The answers to these, and other questions, are found inside. The following articles are available for the 'Refrigerator' topic. Click the article''s title (shown in bold) to see the associated article. Perhaps one of the most difficult cleaning problems a person can face in the kitchen is having a mildew infested refrigerator. While most parts of the refrigerator are fairly easy to clean, if you happen to get some mildew into the icemaker you can find yourself facing a fairly difficult problem. Cleaning mildew from an icemaker doesn't need to be that hard. Simply follow these suggestions. Stainless steel appliances make your kitchen look great but they need to be cleaned at least two times per month to keep them looking that way. Here's the info you need to make your refrigerator look as good as it can. Are you running away from that neglected fridge? Have the leftovers taken over and you feel that it is time to reclaim the fridge? Unfortunately, we often bypass the fridge when it comes for cleaning. With wood paneling, a refrigerator can blend in to the rest of the kitchen. When cleaning the surface of this appliance, use techniques similar to those used while cleaning cabinets. Use cleaners that are safe on wood and always dry the surface thoroughly when done. For some reason many people forget to look into automatic icemaker when they are cleaning their kitchen. Cleaning your freezer's automatic icemaker isn't only easy to do, but also can be an important health habit to get into. Just follow these directions to ensure you get it done the right way. 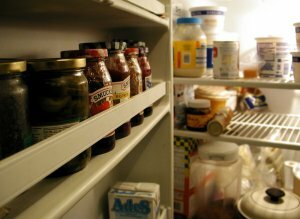 For many people, refrigerators are more than something to store their food in. If there are children in the home, then refrigerators are also bulletin boards and art galleries. In such situations the magnets used to hold the artwork and the notes can sometimes leave stains of their own. Dealing with magnet stains can be a bit of a headache if you don't know what to do. Have you ever noticed just how easy it is to have your refrigerator collect odors? While you may think that getting rid of odors in your refrigerator is a difficult project, it really isn't. Freezers build up tons of frost over long periods of time, but you can prevent some of this build up with a simple household item. Next time you defrost your freezer, coat the inside with any kind of cooking oil. The freezer will build up less frost and be easier to defrost next time you do it. This is a quicker way to clean your refrigerator. All you'll need is antibacterial wipes, a wastebasket, and about a half an hour. There are all kinds of ways that a refrigerator can obtain some kind of strange or nasty odor. But there is one odor that is arguably the most difficult to remove and that is the odor of seafood. Removing seafood odor from refrigerators may seem like only a dream, but it is possible. A warm refrigerator creates many problems, but mildew and the stench that comes with it are no longer a problem. Simply put newspaper in your refrigerator whenever you have to turn it off. The newspaper will absorb excess moisture and prevent mildew. For one reason or another, refrigerators have a tendency to collect odors, most especially if they get turned off without you knowing it. Dealing with stubborn refrigerator odors can be a really difficult, or even tedious to get rid of. However, just because it is a little difficult to get rid of stubborn refrigerator odors, doesn't mean that it is impossible. Kitchens get dirty easily, but this tip will help take the strain off of cleaning the biggest appliance in your kitchen: the refrigerator. Buffing your fridge with car wax will keep your refrigerator cleaner longer on the inside and outside by keeping food and other gunk from sticking to your fridge's surfaces. It will also make messes in the refrigerator easier to clean up.